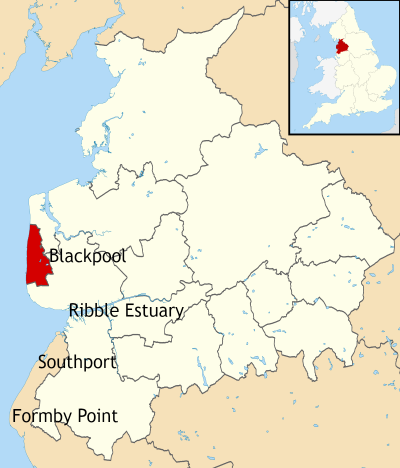 Map of Lancashire with Blackpool highlighted. Source: OS Survey OpenData. Author: Nilfanion. Creative Commons. I don’t mean any disrespect to the town in saying that, it’s just that in February many seaside towns are notoriously ‘dead’ and, on this occasion, Blackpool proved to be no exception. Here are a few photos of the Promenade as we walked along it. Admittedly the absence of sunshine didn’t help . 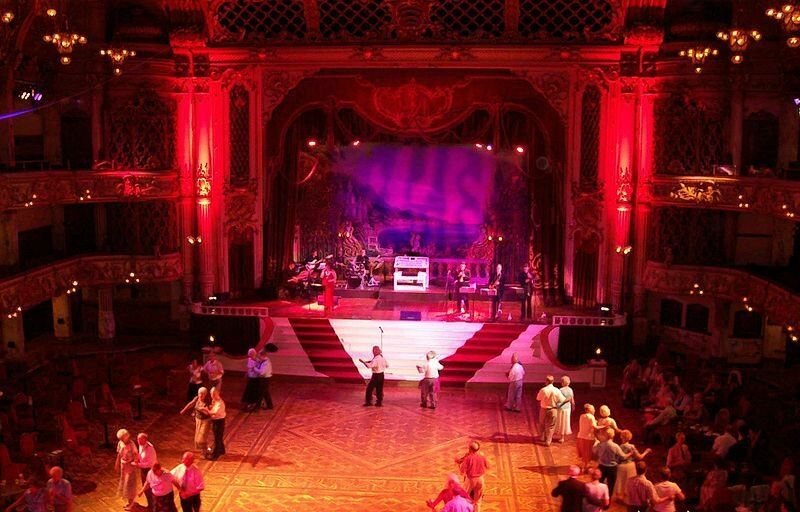 . .
Blackpool got its name from a historic drainage channel called Spen Dyke, which ran over a peat bog. Blackened water was discharged into the Irish Sea, forming a black pool on the other side of the sea. Dublin (or Dubh Linn) comes from the Irish name for ‘black pool’. 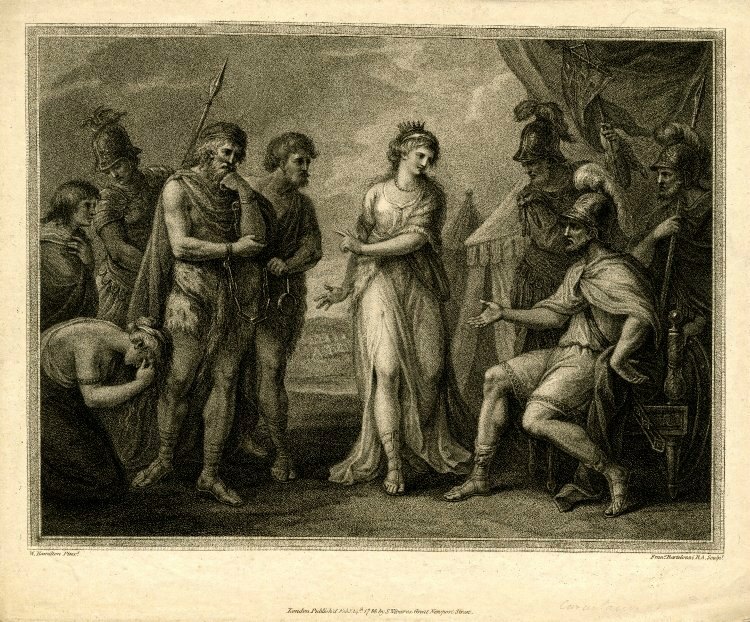 The area behind the town, known as the Fylde, was once inhabited by a Celtic tribe called the Setantii, a sub tribe of the Brigantes (whose most famous queen was Cartimandua, who stayed loyal to the Romans at the time of the Boudica rebellion). 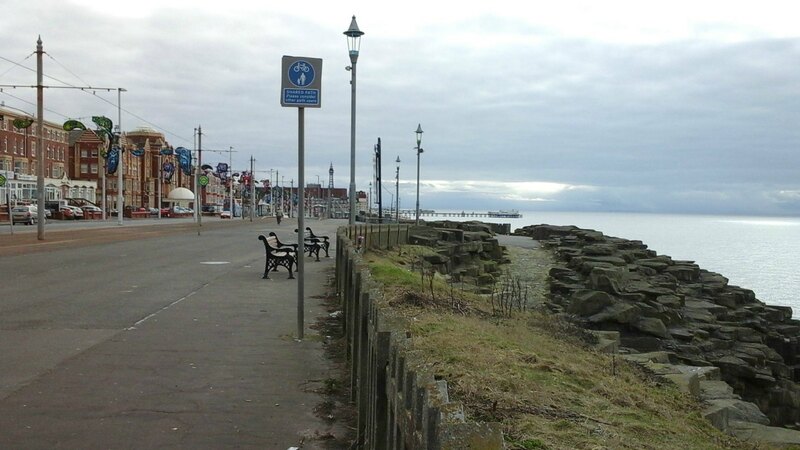 The area developed very slowly for hundreds of years, some of the small, coastal villages eventually becoming part of Blackpool. 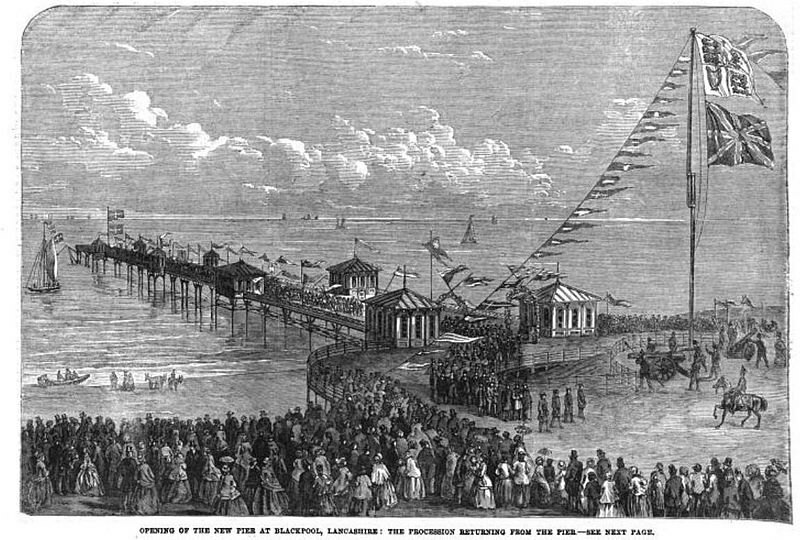 But it wasn’t until the 18th century, when the practice of sea bathing to cure diseases became fashionable with the wealthier classes, that Blackpool really began to grow. By 1781 a private road was built to the town and a regular stagecoach service to Manchester and Halifax started. A few amenities, hotels, an archery stall and a bowling green developed – and the town steadily grew By 1801, the population was 473. 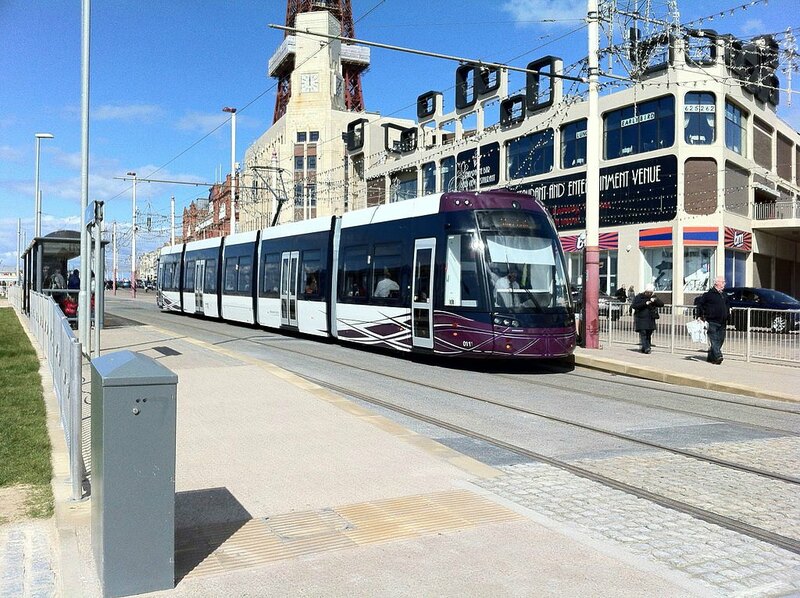 But the most important factor in Blackpool’s early growth was the arrival of the railways. By 1851 the population had reached 2,500. With the sudden increase of visitors came the need for more accommodation, and more attractions. Gas lighting was introduced in 1852 and piped water in 1854. By this time, the Lancashire cotton industry was thriving and it became the practice among mill owners to close for one week a year for servicing and repairing machines. Many mill workers would stream into Blackpool. Fortunately, each mill closed for a different week, enabling the town to keep a steady flow of visitors throughout the summer. 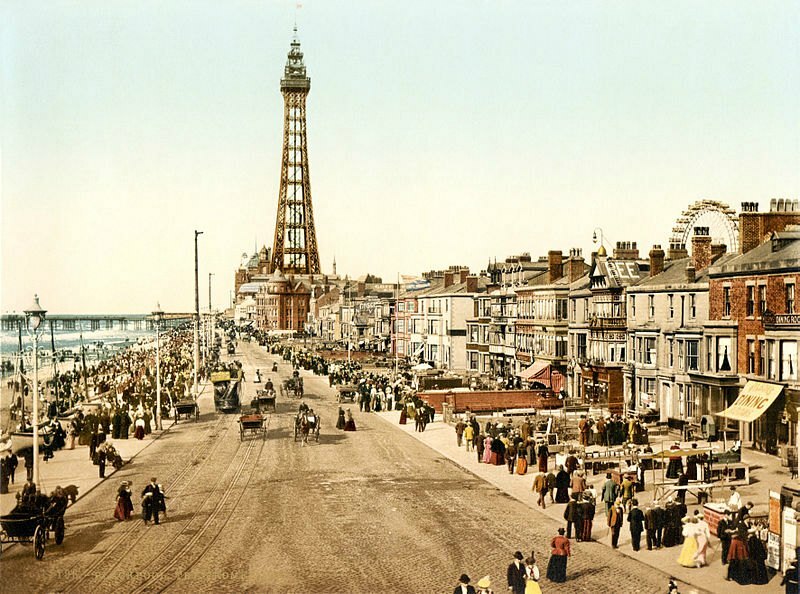 Between 1863 and 1893, three piers were constructed out over the sea (North, Central and South Piers) – and Blackpool proudly became the only town in Britain with three piers. 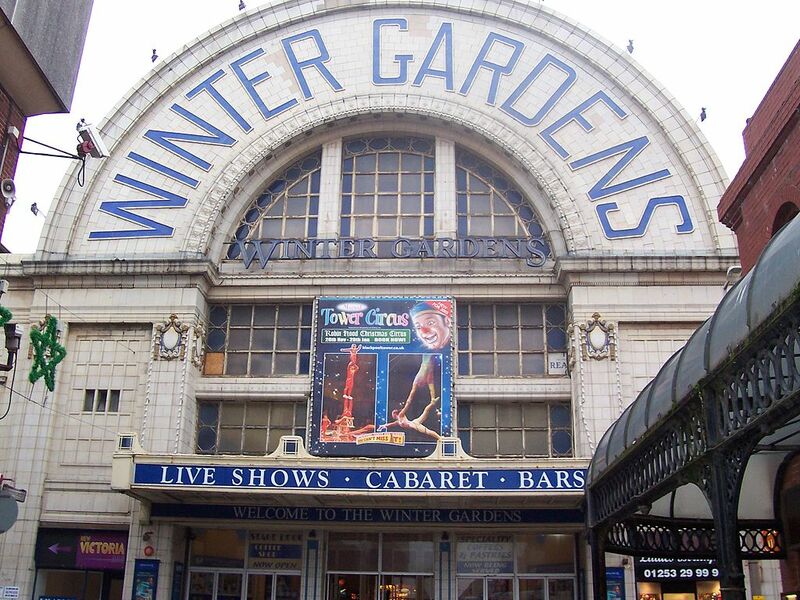 The Winter Gardens (a larger entertainment complex including a variety of venues, including a theatre and ballroom and conference facilities) was opened in 1878. And the town’s most famous building, the Blackpool Tower, was first opened to the public in 1894. At 518 feet high, it is the 103rd tallest freestanding building in the world. On clear days it can be seen from as far away as North Wales and the Lake District. At the summit is a flagpole and buried beneath the foundations is a time capsule. How exciting! (No, I’m not being sarky.) The picture below is looking south from the top of the Tower. The Central and South Piers can be seen. 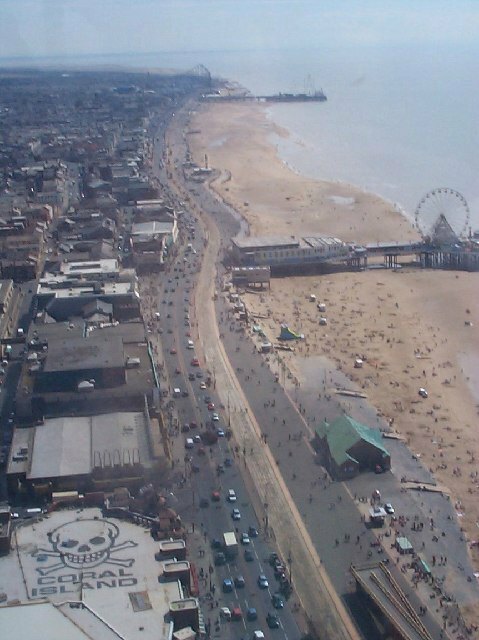 Two years after the Tower was completed, the Pleasure Beach (amusement park/fairground) was founded and has become one of the most visited tourist attractions in the UK and one of the top twenty most visited amusement parks. It holds the record for having the most roller coasters in Europe. Of the ten it has, five are wooden. 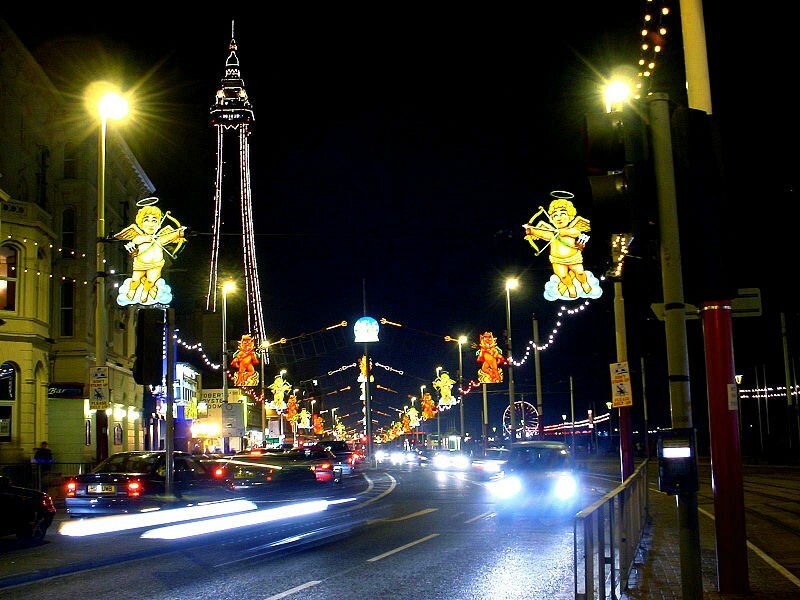 In 1897, Blackpool became the first municipality in the world to have electric street lighting as long stretches of the Promenade were wired. 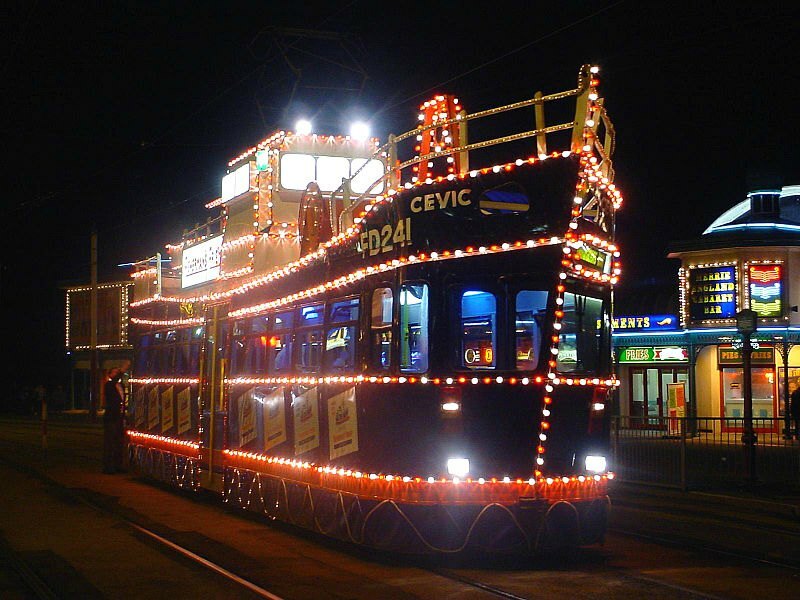 This lighting, and the accompanying pageants, played a big part in the development of the Blackpool illuminations in the autumn – a Lights Festival which runs for around 60 days. Large numbers of people visit the illuminations every year. In 2016 they will be ‘on’ from September 2nd until November 6th (66 days). As a child, my parents took us to see the illuminations on several occasions, and I found the lights, the Disney characters and all the other features totally magical. References: a variety of Wikipedia pages (for images other than my own, plus additional historical detail). I nearly got to Blackpool once; we ended up at Scarborough instead! 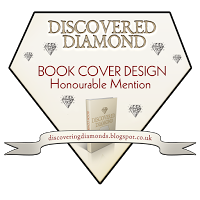 Lovely, so interesting, I found out so much! Fantastic! I admit I don’t like Blackpool in the least. Mind, I haven’t been there for a very long time. I’m trying to write my book, Priya. I haven’t done a WOW post since November. I’ll get back to normal soon, I hope. I wasn’t too bothered about stopping, either, although I used to enjoy doing them. Heena didn’t do any for a while, either, which seems to defeat the object of doing her challenge. I will do more, once I have the time. Great post! I loved the pictures….I hope you are doing fine with the book and everything..ATB! Thanks, Freda. Blackpool’s one of those places that people either love or hate. I must confess, it’s not my choice of holiday resort – but I don’t like amusement arcades and ‘laid on’ entertainment. I just wanted to see if the place had changed in the 30 years since I last visited. But to be fair, it was February, and the ‘bleakness’ was to be expected. Wow 30 years! been so long ! All the best with your book Millie:) I’m doing well too, thanks for asking. Interesting photos and info, Millie. I like the tidbit about the mills being closed and the town having a steady stream of visitors. I imagine how people used to look forward to their “beach days,” much like I do in the summer. We do have things easier today, but sometimes I feel that all of the advances since those old days have made life overly complicated for us! I guess there are things from the modern world that I wouldn’t want to live without, like the medical advancements haha. It’s an interesting point you make about the expectations of success. There’s definitely a feeling of pressure to succeed. I think possibly because we are so connected and aware of what others are achieving. Gosh Millie, that is interesting. I didn’t know anything about Blackpool but I love all the history you have given. What a remarkable change seen in the pictures from then to now….Fascinating. Great photos and an interesting post. But you would have to pay me to go back to Blackpool. Hi Rhys, thanks for visiting! It’s a while since we chatted. I can only agree with you about Blackpool. This was our first outing there since the 80s. I can’t bring myself to like the Promenade – too many amusement arcades and stalls selling rock etc. that make it look ‘tacky’. Yet is atill gets plenty of visitors in the summer. I suppose many non-locals want to see the Tower and ‘Pleasure Beach’, as well as the illuminations in the autumn. I just wished the town had a better ‘look’ to it! I love Blackpool. It really is one of those places that does exactly what it says on the tin. No frills fun!! Blackpool is certainly known as the place to go for a fun time, Cameron. Coachloads used to head there in the past, even from Southport, where I lived. They may still do for all I know. 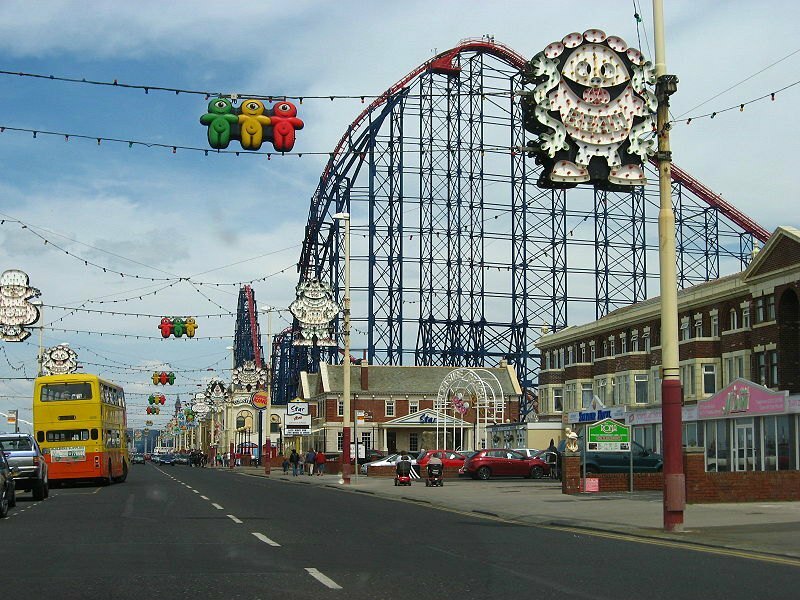 If you like fairgrounds and amusements, Blackpool’s the place to go. In the 1960’s, teenagers loved it there, as well as families with young children. But it’s a place that people tend to either love or hate. February wasn’t the best time of year for a visit! Very informative and lovely post. You are a responsible author. Haha. Its ok Millie. Plz focus on your writing. Its difficult to gather thoughts if you do many things simultaneously. I m reading more blogs now. But after a few days, I will focus on an exam. So very interesting and great pictures! Another interesting post that blends past and present to great effect, Millie! I’m fascinated by the old photo in particular, and thinking about how exciting it must have been to visit this seaside resort at the turn of last century. Especially for those mill workers — what a change of environment, all that fresh air. It’s so odd to think that people were still riding in horse-drawn carriages, but already had amusement parks and ferris wheels! So interesting to learn about a new place! Great info and photos Millie! Very interesting post and photos, Millie. Thanks for sharing. I’ve always enjoyed learning about the history and the life of seaside towns. Thank you Sharifah. The seaside towns in the UK simply can’t compete with the resorts in hotter, sunnier places, especially now travel abroad is so much cheaper than it used to be. Very interesting history and I love the photos as always! A whole different world for me Millie! Blackpool’s a town that I never particularly liked, even in the summer. But its history is interesting. Thank you for sharing the history I didn’t know about. The photograph taken from the tower is so impressive! I wouldn’t climb up to save my life. I love visiting such places ‘out of season’.